Firstly the most popular sensor is the PIR. The PIR in simple terms detects heat from a person or object in the form of infrared light, the sensor through two different lens areas detects differing IR levels and as a result, will switch the light on. The PIR is normally attached to the post just below the lamp posts ladder bars. In this area the body of the sensor is far less noticeable, meaning it is less likely to be noticed by uninvited visitors or detract from the overall beauty of your lamp post. Throughout this article, we explain the use of PIR and microwave sensors within gardens, specifically in use with garden lamp posts. 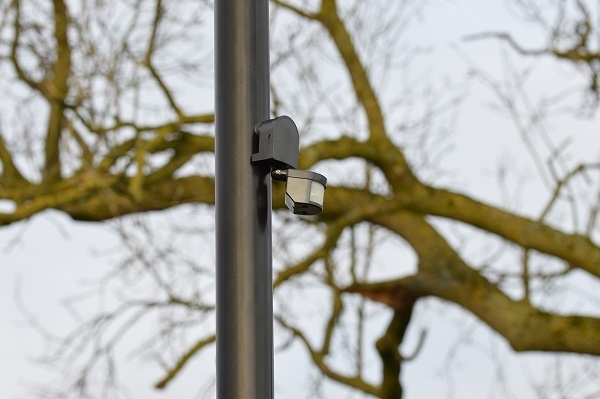 The typical detection radius of a lamp post with this sensor is 180°, making it ideal for use in open gardens, driveways or entrances. The detection area can vary between sensors but generally, a reasonable model will cover a 10-metre distance. A reasonable detection radius is required especially on lamp posts above 3.5metres as we need to account for the height of the sensor on the lamp post in increasing its distance from the intruder. In certain applications, you may feel the PIR is better position lower down the post as shown below. Or that two PIRs should be used in certain open areas of a garden. In using two PIRs with a 180° detection you should then achieve as close to a 360° degree field of detection as possible. The PIR will perform a night and day function and should have a configurable lux setting. The means you can control what darkness level your Garden Lamp Posts will start functioning. You can control how long Garden remains illuminated with a timer setting, generally, timings will range from 30 seconds to 10+ minutes. Please see the following video, demonstrating the use of a single PIR controlling a run of lamp posts in a single circuit. A qualified electrician could install PIRs in parallel meaning your Garden Lamp Posts could be switched on by detecting movement in multiple locations. Although it is advisable to have multiple lamp posts on separate circuits which makes it easier to identify where an intruder maybe. It also ensures the running costs are as low as possible. In the images below you will see that the lamp post has been used for both infrared security cameras and PIR motion sensors. As the infrared light given off from the security cameras is constant it does not interfere with the function of the PIR. Bushes and trees swaying should not typically trigger a PIR sensor, as the sensor is designed to detect infrared light emitted from living things which generate heat. That said if this is a potential problem a PIR with adjustable sensitivity level should be selected. For installation of a PIR sensor on your Garden Lamp Post we recommend the use or a qualified electrician, who may make modifications other than those mentioned in this guide depending on your particular set of circumstances. 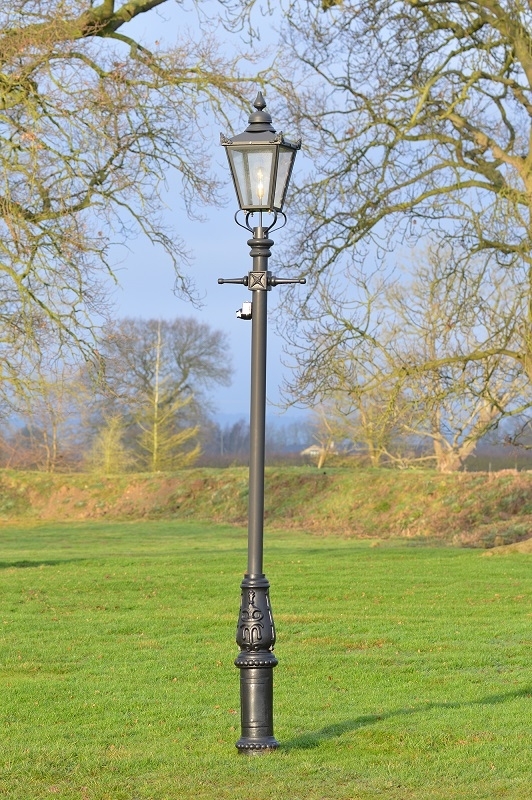 In certain circumstances you may prefer your lamp posts to be on constantly of an evening, to understand the cost of running a Garden Lamp Post click here. 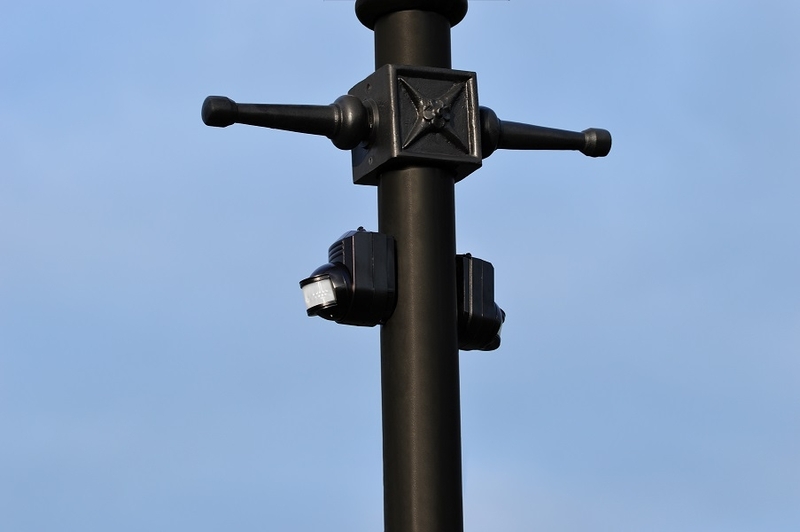 For more information on using CCTV with your lamp posts click here. An alternative to the PIR sensor is a microwave motion detector, these emit high frequency radio waves in order to detect subtle changes in the energy levels reflected back to the sensor. Here we have a microwave sensor built into a surface mounted LED board fitted within one of our lanterns. This can be fitted as an optional extra into any lantern.